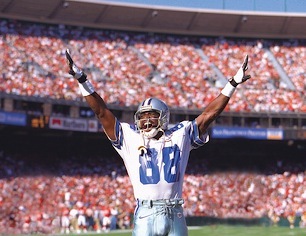 TV Bulletin Board (Dec. 11) -- Michael Irvin goes from Super Bowls to "Superball Sunday"
Hall of Famer Michael Irvin played on three Super Bowl championship teams during his tenure with the Dallas Cowboys. But times change, and many an ex-Cowboy seemingly will do just about anything to stay in the limelight and collect another check. Irvin therefore will be the "special guest sideline reporter" on ABC's Wipeout Superball Sunday -- Cheerleaders Vs. Couch Potatoes -- The Wildest Wipeout Ever. It'll go against NBC's Super Bowl XLIII halftime show, starring Bruce Springsteen. ABC then promises more "hilarious antics immediately following the game," opposite NBC's one-hour edition of The Office. Wipeout, a ratings success this past summer for ABC, is best known for its big red ball obstacle course. So get ready for the "first ever appearance of the Wipeout Big Ball mascot." Maybe that could be Nate Newton. ***In other ancillary Cowboys news, TXA21 hopes to pop your eyeballs with its one-hour The Making of the 2009 Dallas Cowboys Cheerleaders Swimsuit Calendar, cannily scheduled opposite Saturday Night Live on Saturday, Dec. 13th at 10:30 p.m. The special will chart the Cheerleaders' "seven-day journey" to Mexico's Riviera Nayarit, where the skin games begin.